Katy's aunt has left some very strange things locked in a drawer… Things that look ordinary but are actually magic! When Katy and her friend Louise unlock the drawer, they learn some very interesting secrets, but they also discover that magic causes a lot of trouble— especially now that Katy has lost the key! Her aunt is coming to get her stuff back, and if she's a witch, she won't be too happy. 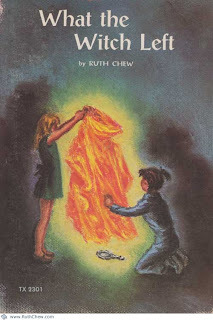 My thoughts: I've written before about how much I love Ruth Chew books, but it's worth mentioning again! Her books are the perfect books to read at Halloween! They are all about witches and magic but they are NOT scary at all. This one is my favorite (I loved the magic gloves and how they went to Mexico in the magic boots). Sadly all of Ruth Chew's books out of print (even though they should not be!) but you can probably get them from the library or find them used pretty easily.